This is a plan for the next 25 to 50 years. It is an investment in the future. The quality, liveability and workability of the city will be set in concrete with this plan. NCCC is generally supportive of what has been presented for The Avenue section of the plan. NCCC is concerned about the overall prescriptive nature of the amendment, given that the Territory Plan has in recent years moved towards an outcomes-based approach. 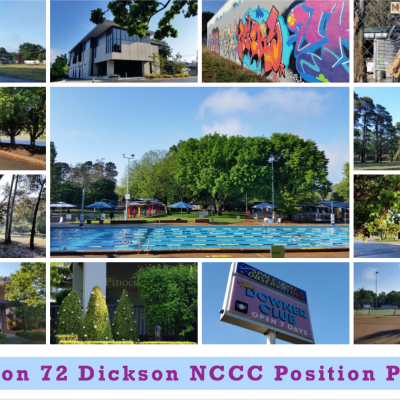 That the meeting (21 Nov 18) requests the NCCC to advocate to retain Section 72 for community and cultural purposes, including, but not limited to, action on the six recommendations in the Working Group’s position paper and in light of the issues and opportunities outlined in the paper. Leon Arundell of NCCC has prepared a discussion paper on issues raised by alternative water and sewerage pricing options. Residents, community groups and businesses have voiced their opinion on the direction of the city centre and its prominent gateway, Northbourne Avenue. Over 300 Canberrans provided their suggestions for the urban renewal of Canberra’s premier centre and its gateway during consultation earlier this year. Consultation on proposed “Kamberra On Federal” development.